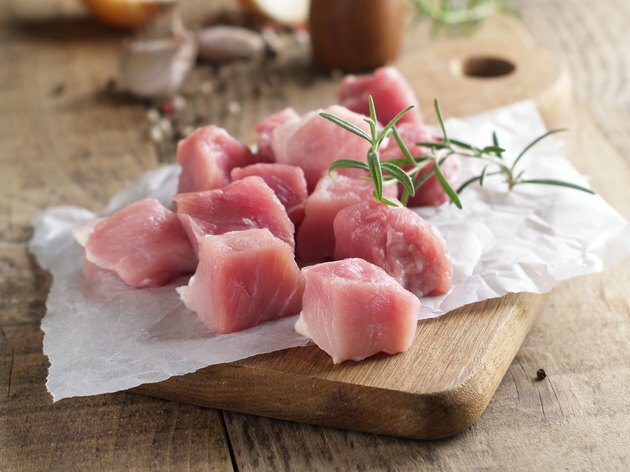 Pork cube steak is a cut, typically from the loin of the pig, that has been pounded with a meat mallet. Some butcher shops use an electric meat mallet, as hand-held mallets can cause the meat to adopt a mushy consistency. The use of the meat mallet makes the pork cube seem more tender and juicy than a cut that has not undergone the same process. Place the pork cube steak into a baking pan and spread 1 cup sliced onions over the top. The onion will keep the pork cube steak moist and tender during the baking process. Cover the baking pan tightly with a sheet of heavy aluminum foil and place it into the oven. Allow the pork cube steak to bake for approximately 45 minutes or until the meat reaches an internal temperature of 165 degrees Fahrenheit. Remove the steak from the oven and allow it to cool for five minutes. Serve the pork cube steak while hot. Depending on preference, remove and discard the onions or serve them on the side. Refrigerate leftover pork cube steak immediately and consume it within three days. If you have a favorite pork cube steak seasoning, coat the meat in 2 tbsp. of it before layering the onions atop it.